Without trying to sound schmaltzy, that World Cup was one of the best times of my life. 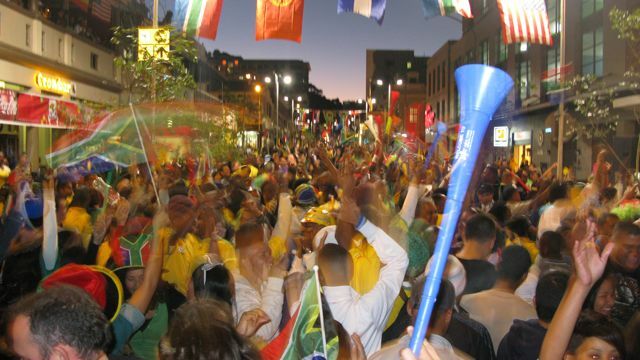 The actual opening night, when Bafana drew with Mexico and then we** spilt into the streets and jived and wooped and tootled our vuvuzelas with enormous vigour was definitely the most goose-bump inducing day I have ever lived. Stof and I have this theory: South Africa had been bubbling and boiling under the pressure of the challenges we face as a country (poverty, crime, lack of education, loud-mouthed politicians who seem less intent on solving problems than on making them). And then, like a giant Friday night after the worst work week EVER, we were all given permission to party. The entire country erupted! Ordinary people, not the criminals, not the extremists, not the burbling and bumbling politicians, owned the streets and stamped their place on society. 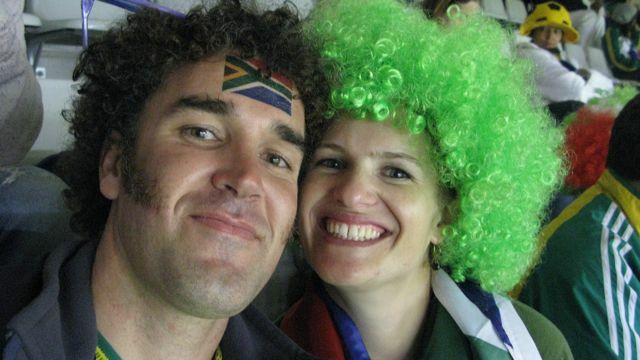 WE stamped our sense of being South African on the world. I think I grinned for a month. 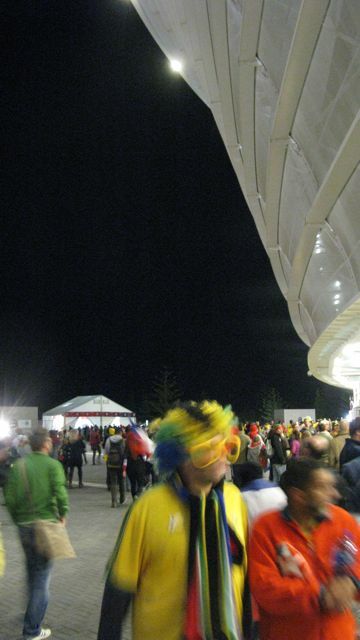 So tonight, I reckon the 51 000 people attending the bafana-usa match (and the inevitable hangers-on) are going to try to re-create that feeling. 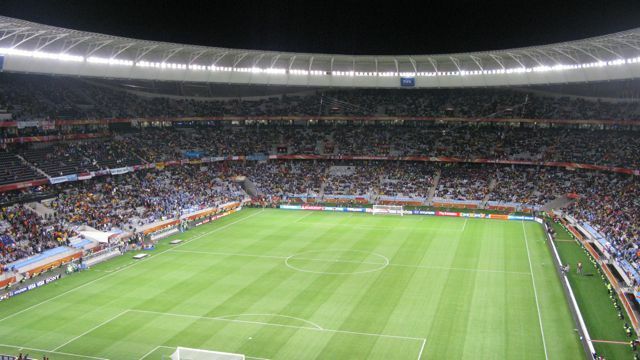 Bafana-bafana have played in Cape Town precisely ONE time in the past five years. (Or it seems that way to my memory.) We were not scheduled any Bafana matches during the world cup and not one of the warm-up games took place on Cape Town soil. In the run-up to the world cup, it didn’t always seem that way. There were a couple of occasions when the newspapers announced that Bafana would indeed play at our beautiful new stadium. Saartjie: I just want to say, on behalf of the people of Cape Town, that we will be crying bitter tears of disappointment into our pillows this evening because we never get to see our own team in action. Best Customer Relations Officer Ever: Madam, I feel your pain. S: No, you do not feel my pain. This is because you are in Pretoria and work for SAFA and no doubt you have had at least one opportunity to watch Bafana-bafana. Us capetonians, we can only support the team from afar: never drawing near enough for Our Boys to hear the ring of our cheers and vuvuzelas in their ears. BCROE: Cape Town has been wronged, there is no doubt! I assure you that we all feel and appreciate your support. You see, The Coach insists on them practising at altitude so they are ultra-fit for the tournament. S: But does The Coach and the rest of SAFA think that Cape Town is not a part of South Africa? Just because we are in the south and have majestic mountains and beautiful beaches and delicious wines and… [focus saartjie!] anyway, that doesn’t mean we don’t love our team too! BCROE: No! No! Even though you have different weather patterns to the rest of the country, we know you are still a part of South Africa. Even The Coach [who was not from South Africa] knows this. A couple of weeks ago, my phone rang! Guess what? It was the BCROE! With a special pre-press release just for me (he didn’t want such an outstanding representative of Cape Town to have to read about the good news in the ‘papers***): The Nelson Mandela Trophy was coming to Cape Town! So at 9:30 (UTC+2), I’ll finally be cheering from the stands for my team. *Bafana-bafana is the name we give to our SA national football side. It means: “The Boys”. **And by “we”, I mean every.single.south.african (practically). *** I kid you not. That guy cracked me up. He’s brilliant! Posts online are all over the place resonating with me…I was just looking at my alma mater’s American football team and thinking “aww! I miss those crazy games! I want to go to one soon!”. And then your sports fan post was in my reader! Love the green wig. I think the most fun thing of sports is the ability to be crazy and get supported. C thinks I am insane. Maybe I should convince him that he should brew a beer about it. Then he’d like it! I love love love a sporting event. Especially a live one. But then, I am my father’s ‘son’ (one of his two daughters had to step up to the proverbial plate)! But, no lovely Jo, I feel far from responsible for the international match happening in CT: it was really a matter of time… I’m still bloody impressed with their customer relations officer for remembering to call me five months later!